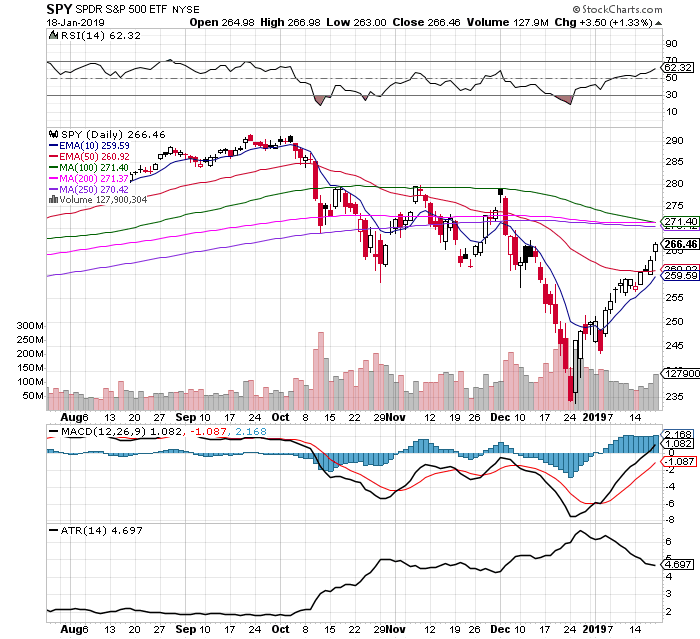 $SPY price is back over all short term moving averages 5 day, 10 day, 20 day and not the 50 day. Last week the volume increases on the swing to higher prices. The trading range continues to decline as measured by the Average True Range (ATR) at 4.69. This shows a decrease in fear and uncertainty on this short term up swing in price. The MACD continues to remain under a bullish crossover. The fast line crossed back over the positive side of the MACD chart for the first time since October. The RSI at 62.32 has room to continue higher before becoming overbought. $VIX at 17.80 continues to swing lower but remains over the key 200 day SMA long term support. The confluence of the 100 day, 200 day, and 250 day SMAs are converging together showing the long term range of the market over the past year. The next key resistance levels on the chart will be at the 250 day SMA and the 70 RSI could be at a confluence of signals. Currently $SPY is in an up swing from the Christmas Eve lows, a new uptrend signal will trigger if $SPY can close above the 100/200/250 SMAs. The market continues to have more bulls signals each day as the up swing continues with sectors and leading stocks showing increasing strength. The Stock Market Made A V-Shaped Recovery. What’s next?